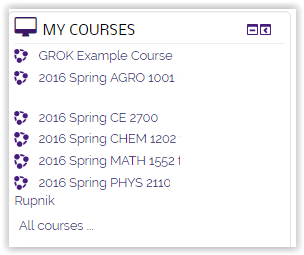 The Courses Block allows view and switch between enrolled courses. Students can add the course block to their Moodle My Home page. If an instructor has added the Courses block to a course, it will appear for students inside the course as well. NOTE: If an instructor has not made a course available to students, it will NOT appear in the list of courses. 1. In the Moodle homepage, click the Edit button in the top right corner of the page. 2. 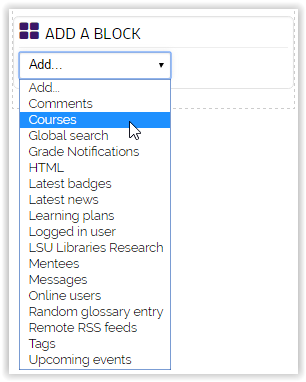 Using the drop down menu in the Add a Block section, select Courses from the list. 3. The Courses block will now be added. 3. Locate the Courses block and click on the Actions (gear shaped) icon. 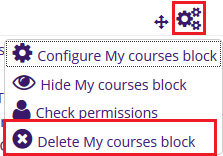 Select Delete My courses block from the drop down menu.